The need for copywriting is to create an awareness about a brand or talk about services to be offered. And the goal of the copywriter is to grab readers' attention and encourage them to purchase the brand or make use of the offered services. For the copywriter to achieve this goal, he must create a very remarkable content that the reader finds very interesting and valuable. A copy must be at it's best in order to yield good results. A copywriter should discover the best ways to achieve this. SEO- Search Engine optimization is the act of trying to get ranked in the top results on a search engine such as Google. This is achieved by finding the keywords that are about what (the brand or services) you are writing on. Copywriting is mostly done online - blogs, websites, email boxes; hence the need for SEO. Focus on your brand, write more on the keyword of the brand, and also try and include all the phrases that can build up the keyword. For instance; when you are writing on ''phones''. Use headlines your readers can never resist. These headlines should draw their attentions. Copywriting is all about advertising your brand. You have to give all the marketable and beneficial information about the brand. Your aim is to market a brand and you have to put the right words together. Copywriting is essentially moving words around to sell better. Offer what a typical prospective buyer cannot reject. You can tell your reader to save some money when they buy your brand, simply because you are taking some percentage off the original cost. Tell your readers you have already made reservations for them, tell them you have already informed your MD about their willingness to buy the offered brand, or tell them that you have figured out the best for them. Outline to the readers the unwanted issues they may have faced in the past, and then propose to offer solutions this time. The 7th tip should be to request your readers' actions. Tell them you are waiting for them to take a decision. Avoid weasel words (words that avoid a direct command). Do not use passive voice. Just instruct them on what to do. 1. Learn why people hire copywriters. The more you learn, the more you discover how dynamic copywriting could be. 2. Do copywriting exercises everyday. Simply, practice makes perfect. 3. Be determined to create a career path with copywriting. This will make you work harder and get more focused. 4. Always refer to copywriting books and materials. You can get a lot of comprehensive copywriting advice and tips from NET-CONTENT. 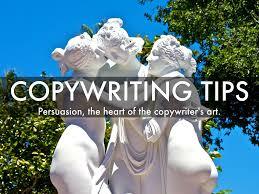 There are a lot of experienced professional writers that can offer you good copywriting tips. Many websites also give copywriting advice, but NET-CONTENT is the best.